The Society is arranging a coach trip to Savill Garden on Saturday 27th April and very much hope you'd like to join us. This is a new venue for our Society but a popular one with some of our members. The pick up will be from the car park in Oak Grove, behind the Trading Hut, and the coach will leave at 9.00 am so please arrive at 8.45 am. We will be returning to Eastcote by 6.00 pm. The price, which includes entry to the garden and coach travel, is £27 each. Once again we held the annual dinner at Sensi Italian Restaurant in Eastcote. Our President, Chairman and several of the committee and society members enjoyed the evening. The food and service and are always first class, delivered by our hosts Lianne and Roy. We held the annual dinner at Sensi Italian Restaurant in Eastcote. This was a return visit as we had a super evening there in 2016. They closed the restaurant to other diners so we were able to sit in a horse shoe shape. Once again, the food was excellent. We have held an annual dinner in local restaurants every autumn since 2000. This is an informal gathering and is open to members and their guests. The 2016 Annual Dinner took place on Wednesday 9 November at Sensi Italian restaurant in Eastcote. A group of 17 members enjoyed a beautiful three course meal and the restaurant was closed to the public for the occasion. On 12 May we set off on our first coach trip of the year. Our trip was to RHS Hyde Hall, the largest of the RHS gardens and is near Chelmsford in Essex. There were 40 members with family and friends and one young lady under three years old. It has been four years since our last visit to Hyde Hall and a lot has changed. There is a new Winter Garden, a Global Growth Vegetable Garden with a new glass house in its centre, Big Sky Meadows, with wildflowers in good colour at this time of year. Hyde Hall is known for spotting hares and we were lucky enough to see one amongst the wildflowers. Some of our members used the new restaurant facility, which is well located with views across the gardens. 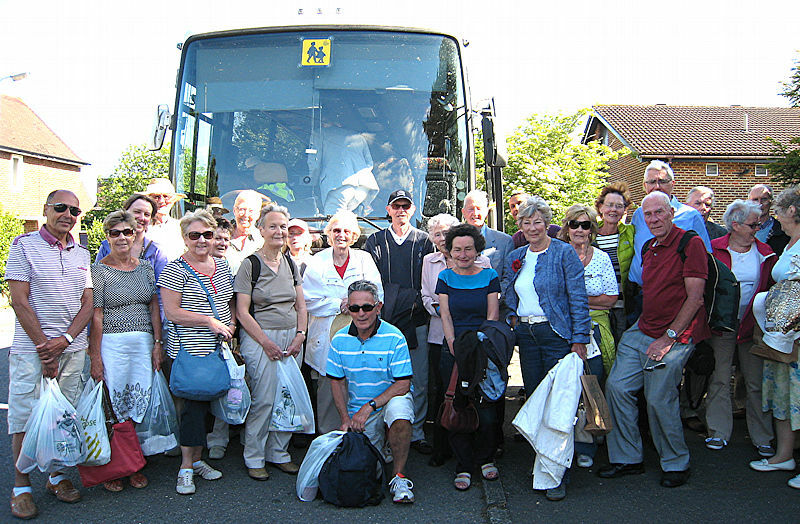 Coach Trip 2017 Our coach trip in May was to one of our favourite and most popular destinations, RHS Wisley Gardens. This was enjoyed by a group of thirty members and friends. The weather page was very pleasant, warm enough to sit out, and the timing was just right to see carpets of bluebells and the wisteria. The first coach trip of the year was to the Royal Botanic Gardens, Kew, on St George's Day, 23 April. Apart from a sharp shower soon after we arrived it was a dry day with a cold chill in the air, even with the sun shining. Several of us made good use of the Kew Explorer land train to see more of the 326 acres than we could on foot, and also to use it as a shelter from the wind. The bluebells were still in flower and there were some waves of narcissus. The formal beds had very striking displays of tulips, two colours and two heights, amongst a carpet of primulas. I was pleased to see the magnolias were still hanging onto their blooms. I explored the two art galleries during the shower, Shirley Sherwood and Marianne North. I will be returning to both on another visit - well worth seeing the botanical art. The White Peaks shop for the children's gifts helped me with a birthday present I needed for a two year old - a book on the garden, with moving parts. The day whizzed by and on the coach home we started talking about where we should go next...all suggestions welcome please. On 10 December we took a trip to Waddesdon Manor. Whilst it was rather a chilly, rainy afternoon we enjoyed seeing the lights on the house and the Christmas Market stalls. The indoor attractions were even more enticing in such weather - the shops festively decorated and the Christmas Shop offered traditional and contemporary decorations and gifts. The gingerbread dolls' house, was an amazing two metre long model of Waddesdon Manor, made entirely from gingerbread. The highlight is always the Manor house, beautifully decorated and themed around "Magical Materials" from earth and sea. Members of the EHS are welcome to join the Ruislip Central Horticultural Society meetings. These take place in St Lawrence Church Hall, Bridle Road, Eastcote at 8pm. There is a small charge to cover the cost of speakers.